Former UK prime minister David Cameron agreed to hold the 2016 EU referendum only because he thought his decision would be blocked by potential coalition partner the Liberal Democrats, Donald Tusk has claimed. Mr Tusk, the European Council president, said the Tory prime minister told him he did not expect to win the 2015 general election outright, and figured Nick Clegg would veto the Brexit vote plan as a price of another coalition. But Mr Tusk told a new documentary, ‘Inside Europe: Ten Years Of Turmoil’, that when that coalition failed to materialise, the UK leader was stuck with his “stupid referendum”. The BBC documentary, due to be broadcast next Monday, features interviews with a broad swathe of political figures from all sides of Brexit, including George Osborne, William Hague, Jean-Claude Juncker and former French president Nicolas Sarkozy. Mr Cameron, who quit as prime minister after leading the failed remain campaign, was the main notable figure not to take part – with producers saying he declined because he has an exclusive deal to write his memoirs. 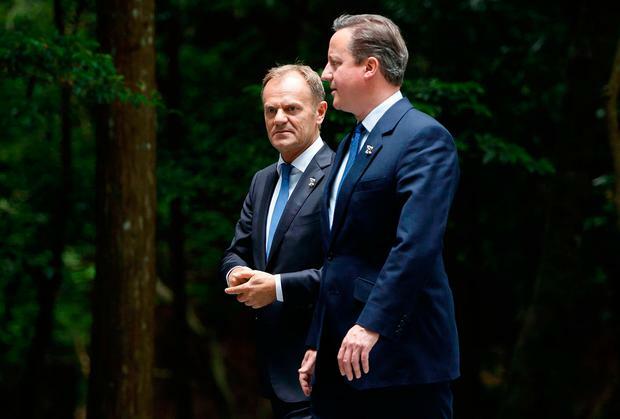 In a straight-talking interview, former Polish prime minister Mr Tusk described talking to Mr Cameron before the referendum, while he was trying to get concessions from EU leaders on migrant benefits in an attempt to head off Eurosceptic Tory MPs. Mr Tusk said he warned the PM there was “no appetite for revolution”, adding: “I asked David Cameron, ‘Why did you decide on this referendum, this – it’s so dangerous, so, even, stupid, you know’. But the claims have since been disputed by Craig Oliver, Mr Cameron’s former director of communications – who also appears in the documentary.